This corded necklace is made using waxed cording for a beautiful piece that will hold it's shape well. It measures 17 inches with a center jeweled piece that adds another 1.5 inches. It is done in a turquoise blue and ivory. The focal rectangular stone is also in turquoise blue with brown and ivory 'webs' running through it. Two pearl rounds surround the stone piece. 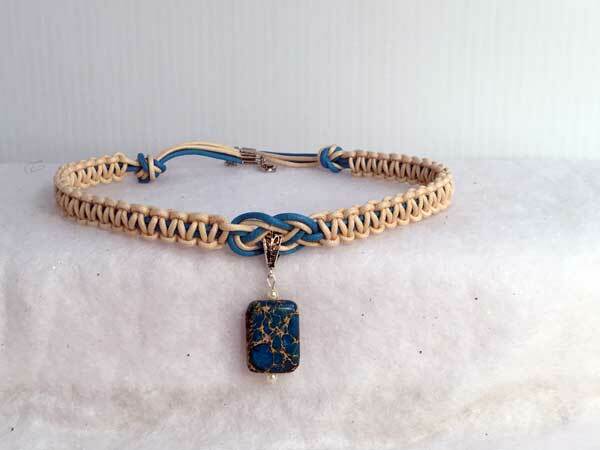 Though the picture shows a medium blue, the colors of this piece, both the stone and the cord is more of a turquoise shade of blue. The piece is finished with a lobster claw clasp.